Assembly Bill 45 would eliminate medical and dental copayments for people inside of California prisons and jails. 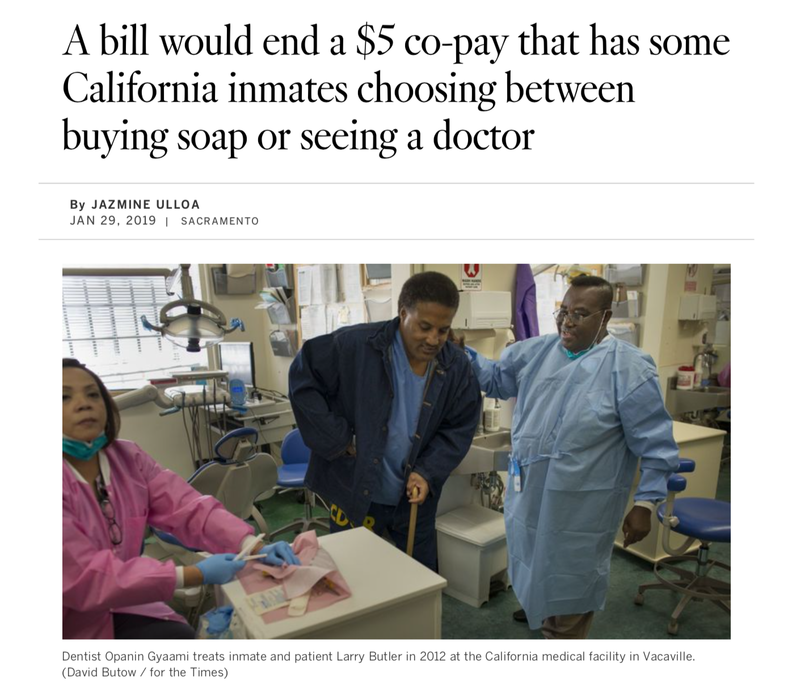 Currently, people in California prisons are charged a $5 copayment when they initiate medical or dental services. The average wage for people in prisons is $0.08 an hour meaning that medical and dental visits can cost more than one week’s pay. The high cost of healthcare in prisons discourages many people from seeking care until it is an emergency. This barrier to healthcare jeopardizes not just the health of the imprisoned, but also the health of prison staff and the public, as sick people who avoid doctors are more likely to suffer from more severe illness and increased infection rates. AB 45 was introduced by Assemblymember Mark Stone (D-Monterey Bay) and is sponsored by Initiate Justice, ACLU of California, California Coalition for Women Prisoners, the Ella Baker Center for Human Rights, and the Union of American Physicians and Dentists. Visit the California Legislative Information page for AB 45 to follow this bill. 02/21/19 Update: as a result of this campaign, CDCR announced that they will no longer charge copays for medical and dental services! While this is a big win, we still need to pass AB 45 to make this policy permanent CA law, and to extend copay relief to people in local jails as well. 02/26/19 Update: AB 45 passed the Public Safety committee today. Next up, the Appropriations committee. Read this LA Times Article about AB 45, featuring a quote from David “Jazz” Brown, an IJ Inside Organizer who has been negatively affected by copays and poor medical care inside.